Prominent & Leading Service Provider from Pune, we offer airmagik clean room, airmagik clean room doors, airmagik clean room ceiling, airmagik air shower, airmagik pass box and airmagik air curtain. 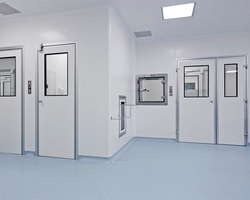 Techpanacea’s Airmagik Clean Room typically used in manufacturing or scientific research, a cleanroom is a controlled environment that has a low level of pollutants such as dust, airborne microbes, aerosol particles, and chemical vapors. To be exact, a cleanroom has a controlled level of contamination that is specified by the number of particles per cubic meter at a specified particle size. The ambient air outside in a typical city environment contains 35,000,000 particles per cubic meter, 0.5 mm and larger in diameter, corresponding to an ISO 9 cleanroom which is at the lowest level of cleanroom standards. as well as critical process manufacturing common in Aerospace, Optics, Military and Department of Energy. The key component is the High Efficiency Particulate Air (HEPA) filter that is used to trap particles that are 0.3 micron and larger in size. All of the air delivered to a cleanroom passes through HEPA filters, and in some cases where stringent cleanliness performance is necessary, Ultra Low Particulate Air (ULPA) filters are used. Both FS 209E and ISO 14644-1 assume log-log relationships between particle size and particle concentration. For that reason, there is no such thing as zero particle concentration. Ordinary room air is approximately class 1,000,000 or ISO . 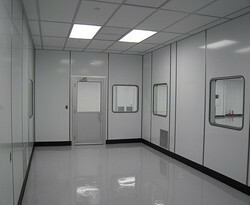 Entryways, outlets and other openings are critical components of cleanrooms. Great care is taken to ensure the cleanliness of the inside of a room, but an equal amount of effort is required for doors, windows and pass-throughs. On these pages, find Airmagik’s selection of manual swing, sliding and soft-wall panel doors, as well as automated, hands-free swing and sliding doors in either single- or double-wide widths. Automated roll-up doors add convenience and efficiency, and can be mounted in walls, or along floors. Airmagik’swindow selection includes glass, static-dissipative and other cleanroom-compatible materials. Our durable frames are specially designed to simplify cleaning and disinfecting. 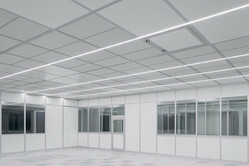 Techpanacea’s Airmagik advances cleanroom standards with its ceiling system components. Our state-of-the-art systems help tight-tolerance temperature and humidity-controlled environments conform with the latest government and industry standards. 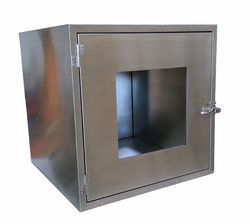 After ceiling blanks, light fixtures, and filters are installed in the grid, a secure, airtight barrier is formed against dust and moisture for sensitive cleanroom needs. Opaque white, resistant to most chemicals, including biocides used in ceiling wash-down. Won't shed particles or outgas, making them ideal for all cleanliness classifications. Vinyl-Coated Gypsum:These white panels feature a non-combustible gypsum core that assures fire safety. Sturdy vinyl laminate is suitable for cleanliness levels from ISO 6 – ISO 8 (Class 1000 – Class 100,000). Pass Thrus are used as a means of moving parts and/or materials from a non-controlled environment to a clean room environment. 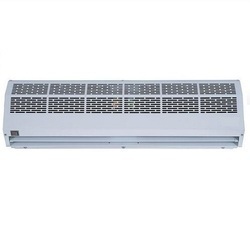 The SP model is a wall mounted pass thru and the CT model is a floor mounted pass thru - both are used for controlling cross contamination between two zones. The AL is used to transport personnel from a non-controlled environment when an Air Shower isn''t needed.ASPT offers a wide variety of sizes and construction materials in order to offer the most customized and affordable product for each individual need.If you are unsure of what tpye of Pass Thru you may need for your particular project please check out our Pass Thru Questionnaire.